Architectural Landscape Lighting in Armfield Neighborhood, Summerfield, NC 27358. PROJECT SUMMARY: This Armfield home stands out from the crowd with its beautiful paver driveway and simple and sophisticated architecture and was installed several years ago. Southern Lights performs routine lighting maintenance for these clients ensuring system is running at 100%. After this photo shoot and a night time visit, additional pruning was needed to keep shadows from appearing on the home’s front elevation. As see in a few of these images, plant growth can take away from the overall lighting effect. A quick pruning on the back side of these foundation shrubs was all that was needed to remove the dark shadows. This landscape lighting system started its life with Halogen lamps and over the years has been upgraded to LED. Even though this lighting design was simple, Southern Lights still spent time developing the layout and lighting design. During the design phase, Southern Lights provided the customer with additional lighting options that could be added onto down the road. 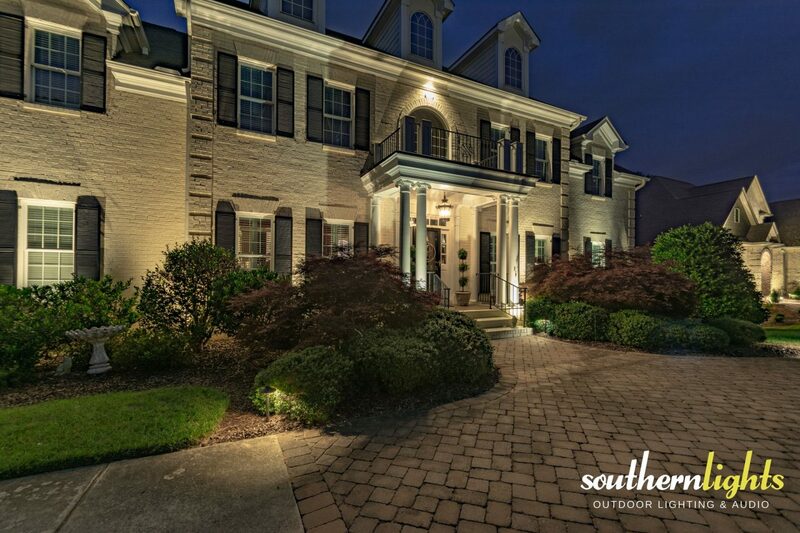 LANDSCAPE LIGHTING FOCUS: The goal for this architectural landscape lighting project was to illuminate the home and have some of that light reflect back into the landscape and driveway brightening the front yard. The front steps were highlighted with copper path lights to ensure safe elevation changes and also to help light the motor court circle driveway. LOCATION: The architectural landscape lighting designs and installation for this project can be found in the Armfield Neighborhood in Summerfield, NC 27358. LANDSCAPE LIGHTING FIXTURES: 100% Made in the USA Clarolux Landscape Lighting Fixtures were used in this lighting design. Clarolux BL23 “Ravenna” Bullet Directional Copper, Clarolux AL1 “Barletta” Area & Path Light Copper. LANDSCAPE LIGHTING DESIGN: Ideal landscape lighting should evoke Safety. Security. SERENITY and should always start with a design. Southern Lights likes to start with “The End in Mind,” meaning that our lighting designs and installations are built for flexibility and additions as plant material grows and changes or additional outdoor landscape lighting is desired. With white homes you have to be careful not to overlight. Carefully placed fixtures with the right wattage and beam angles are necessary to create a balanced lighting effect. The front porch and columns of the home were beautiful, but created a dark area above it. Normally, Southern Lights would opt for a custom gutter mounted fixtures, but since this home did not have a gutter on the flat roof, we chose to install a custom recessed can light in the 2nd floor shining down.